“Peninei Halachah” is a series of books on Jewish Law (halachah) by Rabbi Eliezer Melamed, Rosh Yeshiva and Rabbi of the community Har Bracha.The series “Peninei Halachah” is a unique and comprehensive creation of books on halachah. The series passes on the tradition of generations of halachic decisions in a refreshing, Israel-spirited fashion – “aged and choice wine in a new and beautiful vessel”. Befitting the generation of the “Ingathering of the Exiles” and the beginning of the Redemption, the books are written in a clear and modernized language, clarifying the halachot with their spiritual meanings, and relating to the customs of the various ethnic groups. The halachot are explained starting from the general rules down to the minor details, with an emphasis on relevant issues which have arisen in the modern era. Thus, the books help to strengthen the obsevance of halachah amongst the Jewish nation to serve as a bridge between the Heavenly morals and everyday life, and to add love for the Torah amongst those who study halachah. Until now, twelve books have been published in the series. Over 200,000 books from the series “Peninei Halachah” are studied in thousands of homes and educational institutions in Israel. The series is currently being translated into English, French, Russian and Spanish. So far, three Books have been translated into English: Tefilah, Pesach and Zemanim. Tefilah – the foundations of the laws of prayer, the preparations before prayer, the three prayers themselves, the Amidah, the Shema prayer before sleep, the appropriate place for prayer and the minyan, the differing versions of prayer, and more. 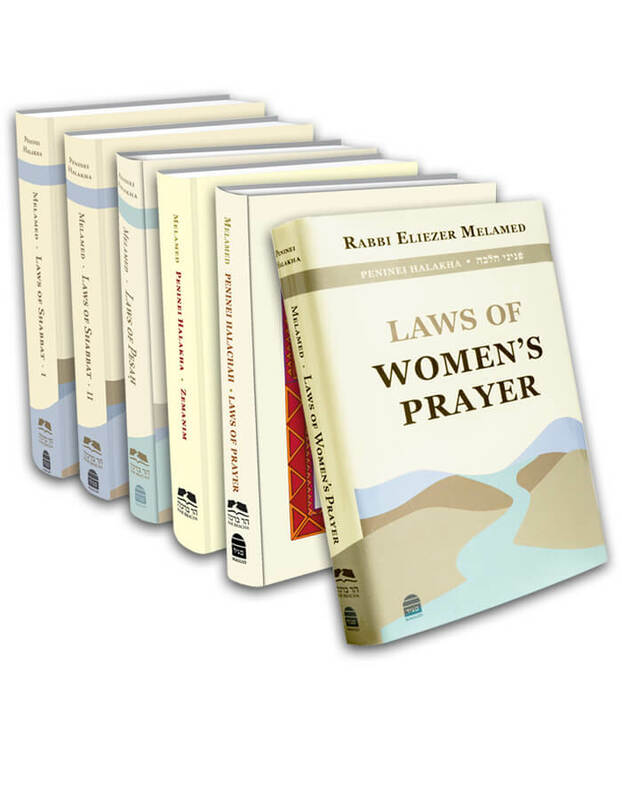 Tefilat Nashim – the laws of prayer with an emphasis on the uniqueness of women’s prayer in halachah and its reasons. In addition, some of the laws of prayer and Kiddush for Shabbat and holidays were added to the book, with emphasis on the laws relating to women, and a general chapter on differing versions of prayer and customs. Berachot – includes the laws of blessings over food and washing of the hands, the blessings of fragrances, the blessings on unusual sights, blessings over happy occasions, the blessing ‘hagomel’, and the laws of ‘derech eretz’. Shabbat A and B – includes preparations for Shabbat, the times of Shabbat, the lighting of the Shabbat candles, the laws of Kiddush, Havdalah, the meals, the Tefilot and Torah study on Shabbat. The books then deal with forbidden acts on shabbat: cooking, kindling and extinguishing fire, electricity, washing clothes, carrying from one domain to another, ‘borer’, ‘eruvin’, ‘muktze’ the laws of sickness and healing on Shabbat, Pikuach Nefesh and army duties, and many more subjects..
Pesach – the meaning of the holiday, the rules of the prohibition of hametz, the checking for and destroying of hametz, annulment, elimination, and destruction of hametz, mixtures of hametz, topics dealing with kashrut of different foods on Pesach, legumes (“kitniyot”), preparing utensils and the kitchen, the laws and customs of Erev Pesach, the laws of matzah, and the laws of the ‘Seder’ night. Z’manim – the laws of Rosh Chodesh, the counting of the Omer, Memorial Day, Independence Day, Yom Yerushalayim, Lag B’Omer, Channukah, the month of Adar and Purim, the Three Weeks and the Fasts over the Destruction of the Temple – the 10th of Tevet, the 17th of Tamuz, Tisha b’Av, and the Fast of Gedaliah. Moadim – the laws of Yom-Tov, Chol Hamoed, second-day Yom-Tov, Eiruv-Tavshilin and Shavuot. The Nation and the Land – a compilation of laws and faith-based explanations concerning national topics such as the mitzvah to settle the Land, Jewish labor, remembering the Temple, the laws of the army and wars, and the laws of converts. The book includes halachic responses from Rabbi Goren and other rabbi’s on these issues. Likutim A – the book deals with the laws of Talmud Torah, educating towards Torah, the Sefer Torah, repository for old religious items (‘geniza’), synagogue, kippa (yarmulke), tzitzit, tefilin, mezuzah, Kohanim, tithes, etc. Likutim B – the book deals with the laws between man and his fellow man, such as: telling the truth, deceit, stealing, loans, charity, hospitality, the laws of a murderer and one who commits suicide, guarding one’s life, road safety, abortion, autopsies, transplants, etc. Likutim C and Family – this book deals with laws concerning family life, such as: brit milah, pidyon ha’ben, marriage, modesty, physical relations, and honoring parents. The laws of ‘bal tashcheet’ and the immersing of utensils in a mikveh are also dealt with. *In the three Likutim books, the basic laws of each topic are discussed and not all of the halachic details. Further books are planned to be published in the near future, G-d willing. The books in the series “Peninei Halachah” have merited the approval of the Gedolei Ha’dor, including Rabbi Avraham Elkana Kahana Shapira זצ”ל , Rabbi Shlomo Goren זצ”ל , Rabbi Shaul Yisraeliז צ”ל , Rabbi Mordechai Eliyahu זצ”ל, Rabbi Eliyahu Bakshi Doron, Rabbi Meir Mazuz, Rabbi Dov Lior, and Rabbi Nachum Eliezer Rabinowitz. Educational Programs“Peninei Halachah” has received wide-acceptance amongst students in numerous institutions. In yeshivot, pre-military academies, and in girl’s seminaries the books are learned joyfully and studiously. Additonally, the books have made their mark in high schools, yeshiva-high schools and ulpanot, enabling students to strengthen and grow in the study of halachah. Students eagerly await the publication of more books in the series. The books have been incorporated in various educational programs, and the Ministry of Education has approved matriculation exams based on the series.